​A summary of an article by C J Binding and L J Wilson reproduced with their kind permission. 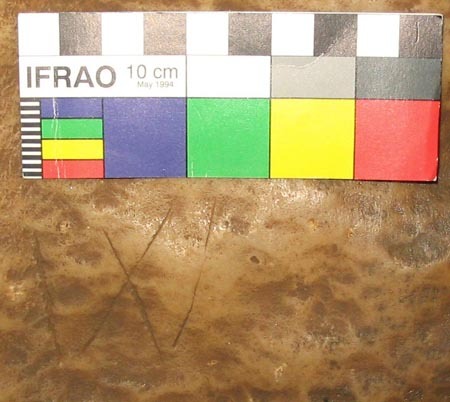 The original article provided detail about inscribed markings found in Goatchurch Cavern, North Somerset which have been identified as ritual protection marks, possibly dating from the period 1550 to 1750. The term ritual protection mark was preferred to the description "witch marks" used in some references in order to avoid confusion with the same term which is used in many writings to refer to the marks left on a witch's body by its familiar (used as a diagnostic in many witchcraft trials). During November 2003 inscribed marks were noticed in Goatchurch Cavern while cleaning away graffiti. Three finely cut marks were uncovered, resembling the letter W with a patina darker than in nearby graffiti dated 1704. Photographs of the marks were taken but no conclusions were reached at the time. Later an article was published in The Guardian newspaper entitled "Scare witch project. Repairs at Kew Palace uncover a tradition of superstition". The similarity to the markings from Goatchurch was immediately apparent, although the ones from the cave resembled Ws, rather than the M illustrated in the newspaper article. Contact was made with Timothy Easton who has conducted extensive research on ritual marks; he agreed that the marks in the cave were similar in form and size to ritual protection marks found elsewhere, both in timber buildings and on stonework in various churches and he kindly contributed an Appendix to the published findings in which he advanced reasons for his belief that the conjoined double V or W is an invocation to the Virgin Mary. Superstitions have long been associated with caves and it was during the mid sixteenth to the mid seventeenth centuries that a belief arose that a large stalagmite in nearby Wookey Hole was the petrified figure of an old woman and so this formation became known as the Witch of Wookey. 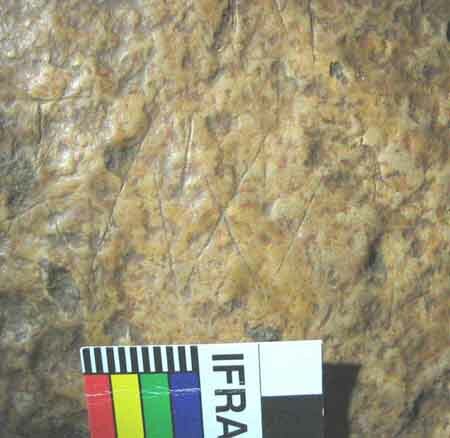 It is possible that these marks were made by superstitious local people who not surprisingly viewed caves as threatening places harbouring harmful spirits; inscribing protective symbols at a point where cold air noticeably issues from the depths of the cave could have been an attempt to ensure that any localised evil remained confined within. The authors would like to acknowledge the help of the following people with this paper: Timothy Easton for providing the Appendix; Graham Mullan, for noticing the Guardian article and his help with work in the cave; Lee Prosser and Brian Hoggard for confirming the authors belief that the marks do indeed resemble ritual protection marks; Professor Ronald Hutton for his time and reassurance; Bob Williams for general information; Dave Irwin, for many useful comments and in particular for providing information from his transcripts and notes on the William Beard notebooks held at the Somerset County Archives in Taunton; Charlotte Hamilton, Trish Beddoes, Tony Boycott and Jayne Stead for help on the original "clean up" day and Andrew Atkinson for assistance recording the marks and as ever, Sir David Wills for his kindness in allowing cavers access to Goatchurch Cavern. L.J. Wilson, 38, Delvin Road, Westbury on Trym, Bristol BS10 5EJ.